Currently under development at JPAW: UHF rf power systems capable of up to 2 MW peak power at 1% duty factor and 100 kW CW. This technological breakthrough provides a major reduction in initial cost and maintenance costs, while increasing reliability. Contact Jim Potter at JPAW for more details. JPAW's parallel triode amplifiers based on Eimac tubes can produce up to 600 kW of peak rf power at UHF frequencies and operate at up to 10% duty factor. The JPAW design is more compact, simpler to operate, more reliable, and an order of magnitude easier to service than older designs. Our high power pulsed-RF systems for accelerators and other demanding applications can produce up to 600 kW of peak RF power at UHF up to 600 MHz and 2,000 kW of peak RF power up to 450 MHz at 1% duty factor with pulse lengths from 1 µsec to 1000 µsec. 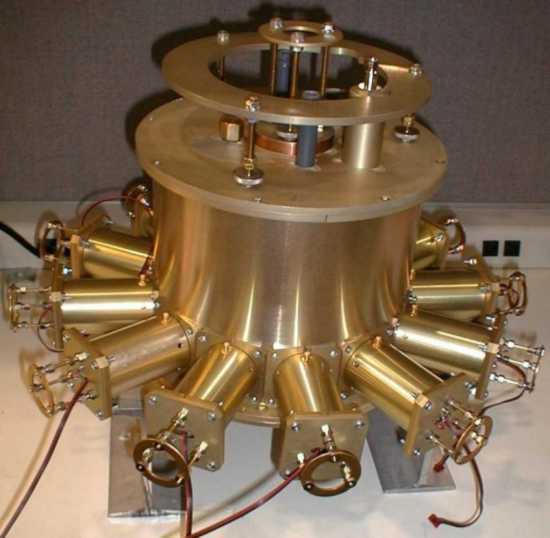 Below is a photo of the final power amplifier for the 240 kW, 600 MHz pulsed rf system for Linac Systems.